A delicious and simple to make pulao for lunch or dinner. Ideal for any family get-togethers, parties or weekend brunch too. 1. Grind together the coconut and ginger garlic paste. 2. Heat oil in a pressure pan over medium flame. 3. Fry the cinnamon, cloves and cardamoms for 30 seconds. 4. Add the ground paste, onions, tomatoes, cauliflower and green peas. 5. Saute for 2 minutes. 6. Add turmeric powder, pepper powder and garam masala powder. 8. Add salt and mint leaves. 9. Add the basmati rice and 3 cups of water. 10. Cover with a lid and pressure cook until 3 to 4 whistles. 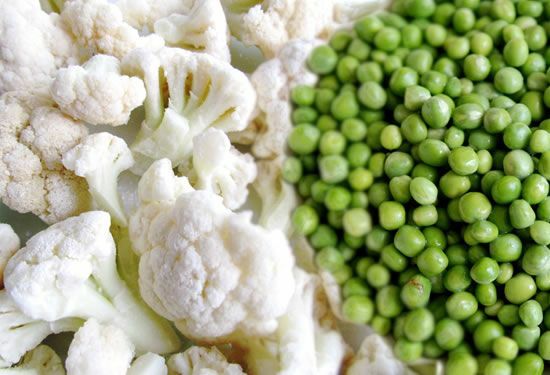 Feel free to comment or share your thoughts on this Cauliflower Peas Pulao Recipe from Awesome Cuisine.